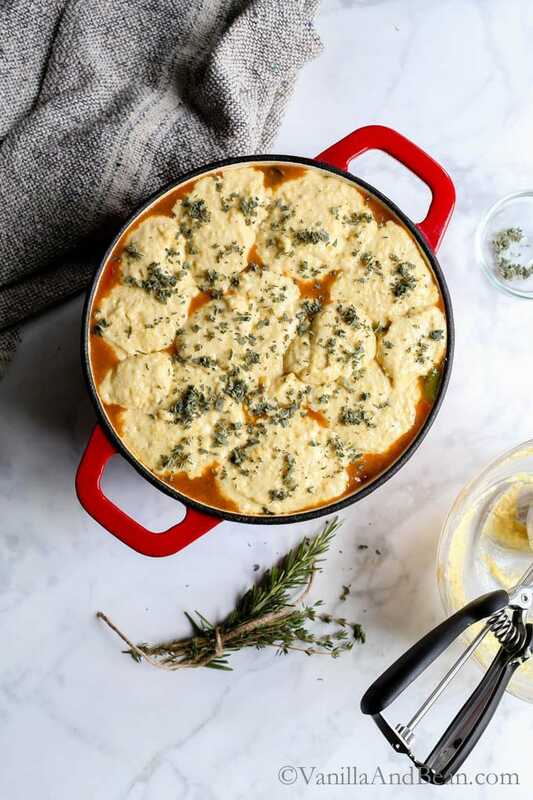 Cozy, one pot Black Eyed Pea Sweet Potato Cornbread Pot Pie is pure comfort food during the coldest parts of the year. 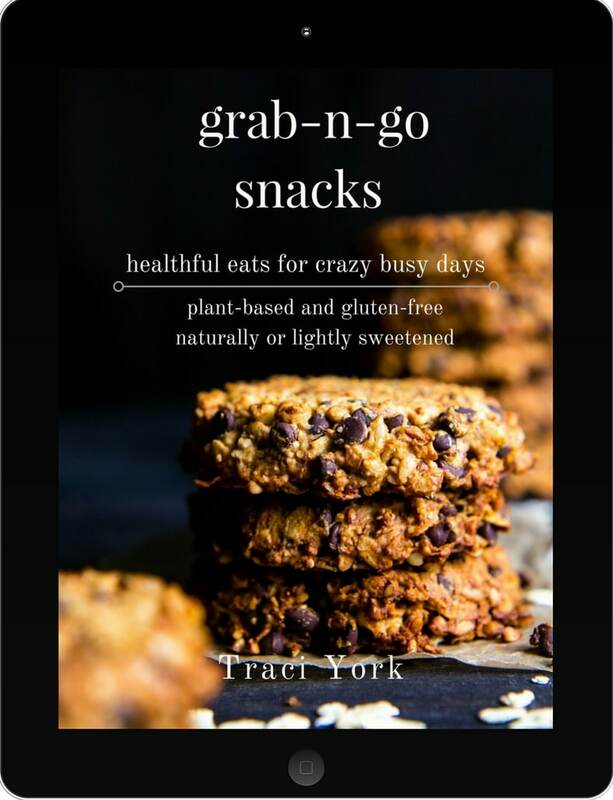 vegetarian + optionally dairy free. I know y’all’ve Spring on the brain.. and I do too. But, comfort food still calls and this vegetarian black eyed pea pot pie recipe appeals to my Southern roots. Black eyed peas were a childhood favorite, especially on New Years Day, because they represent good luck in the New Year. My Ma always had a big crock-pot going. Smelling the aroma wafting through the house all day was like what a kid waiting in line at the ice cream shop endures. All four of us kids were a fan of her black eyed peas. Ma served a generous helping of cornbread and butter with the peas; good for sopping every last drop of broth. Now I eat black eyed peas throughout the year not only because they’re delicious, but also nutrient dense. Sweet potatoes, chard and caramelized onions round out the bulk of this pot pie. It’s a comforting combination of flavors with a good balance of sweet and spicy. The cornbread crust is as Southern as my Ma with a little bit of sweetness sprinkled in for good measure; just like her. Black Eyed Pea Sweet Potato Cornbread Pot Pie is a crowd pleaser, freezes well and makes delicious leftovers. And while there are several steps in the cooking process, it is made in one pot for quick service and clean up. Don’t forget a few glugs of Tabasco! Jalapeños are a welcome addition as well in this vegetarian black eyed pea recipe, if you’re into spicy things. Beyond this cozy vegetarian black eyed pea recipe, I have some sad news to share with y’all about our community. Y’all know how much local farms mean to me. Supporting their work provides incredible benefit not only to me and my family, but also to our surrounding and extended communities. The work these farmers do is hard, yet we barely blink an eye when we pick up a head of lettuce or admire the color of an eggplant. These things are abundant and always there for us, stocked in our grocery stores. It’s easy to take for granted what farmers provide and the relative inexpensive prices they provide it to us. One of our local farms, Willowood Farm, a 4th generation farm, is an icon on Ebey’s Landing National Historic Reserve. The Smith barn of Willowood Farm, built in the late 1800’s, has been in the Smith family since. It’s a huge barn, a one-and-a-half story 100′ x 72′ structure with a large lean-to added in the mid 1900’s. Farmer Georgie grew up on this farm then left for a career only to move back in the early 1990’s to work the land. She, her family and crew have been farming 12 acres since. Willowood Farm grows more than 200 varieties of vegetables, growing and producing almost year round. 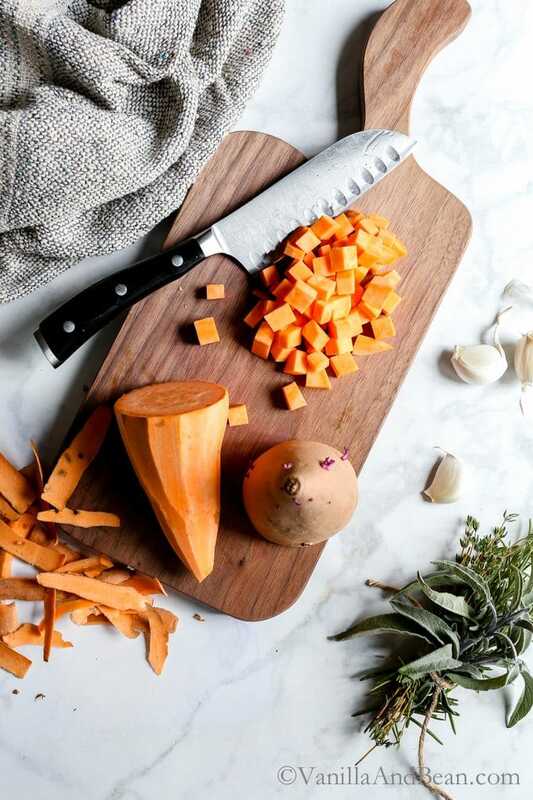 They provide heirloom, and organically raised produce locally through CSAs, farmers markets and farm stands and deliver their produce as far south as Seattle to some of Seattle’s best restaurants. It was because of Farmer Georgie I experienced my first purple potato, pink cauliflower and came to love garlic scapes. This week there was very sad news in our community regarding the Smith barn. It burned to the ground Monday night. The barn was a hub for the farm, housing equipment, used for storage, packing and planning. Everything from harvesting knives, seeds, farm implements, a delivery van, coolers to store vegetables, farm baskets and so much more… all of it, gone. While this is a tremendous loss for Farmer Georgie, her familiy and our community, our community is showing support for the Smith family and their farm. Already there’s been a Never Finished Farming Go Fund Me site opened to benefit Willowood Farm. 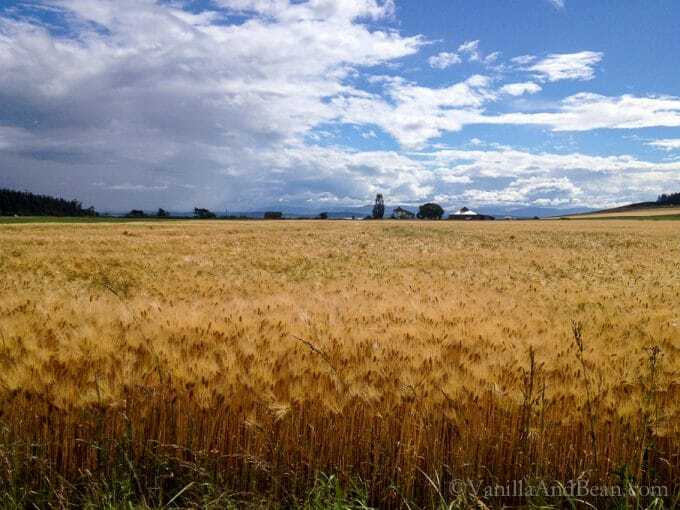 I know many of Vanilla And Bean readers have visited Whidbey Island and Ebey’s Landing… you may have even visited Willowood farm at one of its events. I hope you’ll consider reading about Willowood Farm, and Georgie’s thoughts (scroll down) on the fire and where to go from here, in her own words. It’s opened my eyes to some of the precarious issues small farms face. ***UPDATE*** To read more about the barn, the fire, and this beautiful commuity that’s coming together to support Georgie and Willowood Farm after this tragedy, Georgie has a blog she’s updating. What an inspiration! Remember, it’s CSA (Community Supported Agriculture) season. Be sure to check Local Harvest for your nearest farm and support your local farmer. 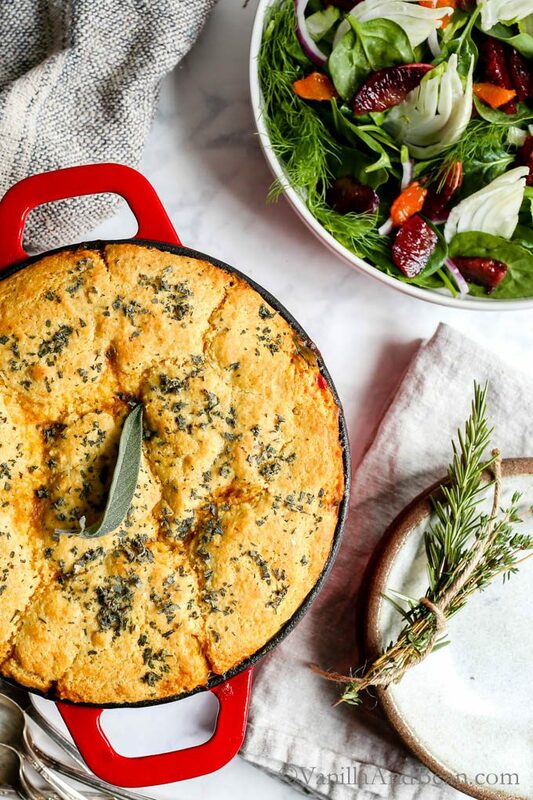 Southern comfort food at its best, this pot pie is packed with caramelized onions, sweet potatoes, black eye peas, chard, bell pepper, and herbs, topped with a sweet cornbread crust. Perfect for a cold winter's night. Vegetarian (dairy free option). In a 3 or 4 quart dutch oven (I use 3 qt but have a bit of spill over while baking), add the coconut oil and heat until shimmering. Add the onions and 1/4 tsp salt. Caramelize the onions on medium low for 30 minutes, stirring occasionally. Use this cook time to prep the remaining veggies. Add the bell pepper and saute for 2-3 minutes just to soften. Sprinkle the flour over the onions and pepper and stir to coat. Stir in the broth, tomato paste, garlic, dry black eyed peas and herb sprigs. Bring to a boil, cover, reduce heat and simmer for 25 minutes. Fish out the herb sprigs and discard. Add the potatoes and mustard, stir and cook for 15 minutes or until just fork tender. While the potatoes are cooking preheat the oven to 425F and prepare the cornbread crust. To the filling, add the chard and Tobasco. Stir in and cook until just wilted, about 3-4 minutes. Remove filling from heat. Taste and adjust seasoning and/or heat. In a mixing bowl, whisk the dry ingredients together: flour, cornmeal, baking powder, baking soda, salt and sugar. To the dry ingredients add the milk, whisked egg and melted butter. Stir until all ingredients are just incorporated. Using a large #20 cookie scoop or 3 Tbs, drop scoop-fulls of cornbread on top of the filling. Fill in the gaps, with smaller scoops as needed until all the cornbread mixture is used up. There will be some gaps on top of the pot pie. This is okay, as those gaps will fill in as the pot pie bakes. Sprinkle top with chopped sage. Set the pot pie on a parchment or silpat lined sheet pan (to catch any spill over) and bake in preheated oven for 20 minutes or until top is set and slightly golden. Freezes well in individual portion sized containers. Thaw in fridge overnight, then bake at 350F for about 15 minutes to rewarm. Thank you for this recipe. I had an odd mix of stored (sweet potatoes), home canned (purple-hulled peas), and frozen produce (peppers) from my garden and the grocery store (onions and a bell pepper) to use up, and this recipe fit the bill nicely. Some recently picked bok choi even worked instead of the chard. I did cut the recipe to fit a 10-inch cast iron skillet (Thou shalt make thy cornbread in cast iron in my neck of the woods), but it worked out great! Thank you! Hi Mitzi! Thank you for coming back and leaving a note! It’s so nice to hear that you enjoyed the recipe. Your modifications sound lovely, and that you procured them as locally as possible :D Hooray for the 10″ skillet! First of all, it pained me to read about the farm. So very proud to know a friend who is doing something about. Thanks for sharing my dear. Secondly, I don’t know how you could ever improve your images, they are simply stunning, always. This is a favorite dish of mine and I adore black eyed peas. So so good my love. One of the most creative pot pies I’ve seen in a long time. Love it! I remember you sharing the news of your local farm on IG. Such a sad story. But they are very lucky to have wonderful neighbors like you reaching out to help! Sorry to hear about the farm – what a terrible blow for your community. Hopefully they will be up and running in no time. 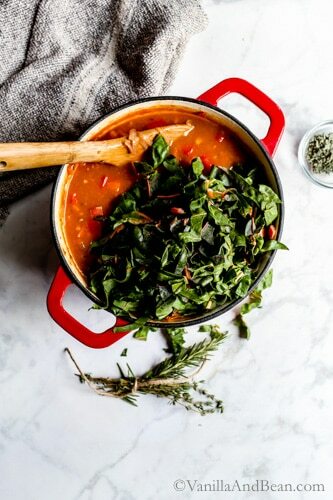 Love your new photos, Traci – just gorgeous – and this is a such a hearty, delicious dish. Who can resist pot pie – especially with corn bread topping! First of all, I can’t imagine any of your images need updating Traci, but these today are stunning. This pot pie sounds totally amazing. I bet the smell in your kitchen was fabulous. So comforting and so hearty. I just love it. So sorry to hear about the Smith barn. What a tragedy. My prayers and thoughts are with Georgie, her family and your entire community. This is such a gorgeous dish! I love the sound of having the cornbread and it soaking up the jucies of the black eyed beans! I love black eyed beans too and we make it a lot the indian way. I am in love with your photos! You put in so much love in all your posts and it resonates. I am so sorry to hear about the farm and I really hope they can recover and bounce back soon. I did donate on the site from your instagram link. You are amazing and wonderful to support local businesses. Beautiful new photos, Traci. And so sorry to hear about the fire at one of your beloved farms. That story pulls at my heart strings. I hope they raise the money to rebuild. Thanks for making us all aware. XOXO. Any suggestion for the topping if one can’t use eggs? Hey Kimberley! Thank you for your note. While I’ve not tested this recipe without an egg, you could try a 1:1 egg replacer or 1/3 C unsweetened applesauce (because apple sauce is naturally sweet, try leaving out or reducing the sugar). I’ve not had success with flax eggs in some baking recipes – I’m not sure if they’d work in this. I hope this helps! A comforting dish to offset such devasting news but thanks, Traci, for sharing so that we have the opportunity to help if inclined. While I only visited Whidbey Island for a day I fell hard and fast under its spell. This looks so good!! I wanna make it like right now! Love this dish. 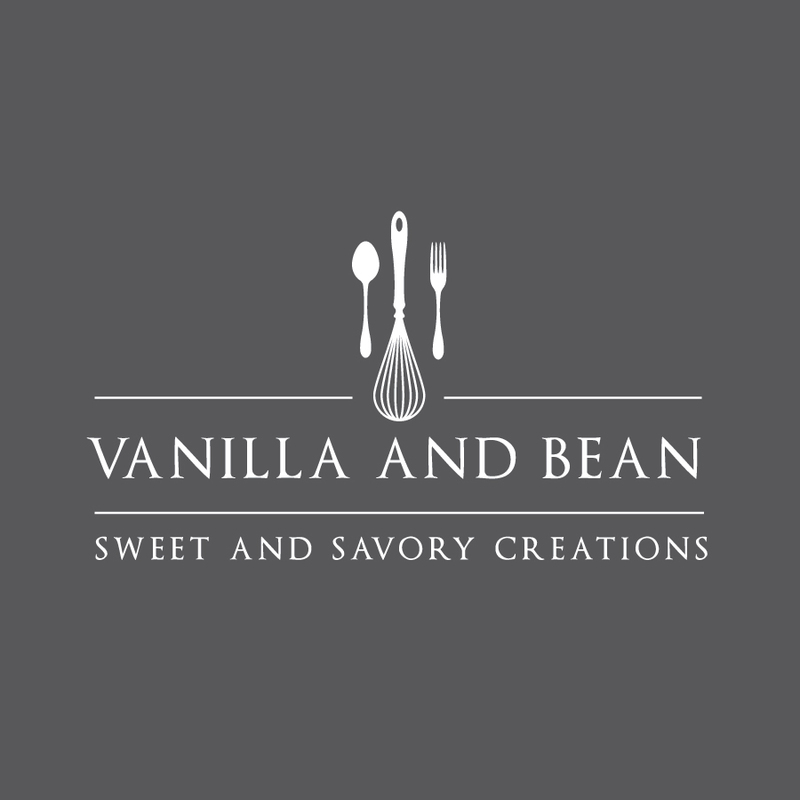 I found Vanilla and Bean while searching for an inventive use of the black eyed peas I purchased impulsively at New Years. I made it this immediately and have made since on cold days! I tried this last night and loved it. It has wonderful flavor and beautiful color. Since I love to bake and normally don’t cook, I can’t believe it came out of my kitchen. One of my kids tried it, but didn’t love it as much as my husband and me…though I’ll try again and again. If anyone has a similar recipe that might be more kid-friendly (read: bland), I’m all ears. Hooray, Renee! Thank you for sharing! YaY YOU! This is such a cozy recipe for sure and packed full of good stuff. We love this one too. So happy you and your husband enjoyed it! (sorry about the kiddos… I can’t be much help there – maybe someone will chime in!). DELISH!!! I can’t wait to try – Quick Question – has anyone tried making it GF? Hi Katie! I’ve not tried it, but I wouldn’t hesitate using Bob’s 1 to 1 GF baking flour in place of the AP flour here. If you try it, please let us know how you do! Enjoy my dear! New fav cold weather dish! I made this for a crowd on New Year’s Eve and it was amazing. It seemed complicated from the picture, but it was so easy and turned out perfect. Who needs meat? I have been craving this every day since I made it. Thank you so much for this recipe, it’s really special. Hooray Kelly! Day made! It’s one of my favorites too! No doubt, black eyed peas are such a delicious staple in our home and I’m always finding new ways to enjoy them. I love your statement(!!) “who needs meat!” Fabulous! SO happy you enjoyed the recipe! Thank you for sharing! Hello! I made this last night but since o didn’t have black eyed peas I used black beans instead. Regrettably the black beans didn’t cook up in time to be done with the rest of the ingredients. Aren’t black eyed peas a bean as well? I thought for sure they would cook up at the same time but thought I’d check with you. The rest of it was SPECTACULAR, though. An incredible flavor! I’ll make it again, definitely, once I figure out my black bean issue. Hi Dani! Thank you for writing and letting us know how you liked the pot pie. Black eyed peas are in the same family as black beans (Legumes), however bean cooking time varies. From my understanding, black eyed peas (BEP) take less time to cook than black beans (BB), at 45-60 min for BEP and 60-90 minutes for BB. For the BEPs in this recipe, cook time tops out at about 65 minutes. If using black beans again, give them a longer than 25 minute simmer before adding the potatoes and cornbread topping. That’ll give them a bit more time to cook. Thank you again for writing! I hope you’ll give this a go again. The black eyed peas are fabulous! Thank you, Paige! I hope you enjoy it! The GIF was fun to do, for sure. Capturing the steam was the challenge for me! Whew! I have booked marked this recipe in my feedly account as a definite keeper! Looking forward to trying it in the future. And it’s so beautiful! I also love the video/gif. And I love your website… You’re gonna make me move to WordPress. I love this Foodie Theme. Starting off…I didn’t even know where to begin. Sorry, I’m all over the board here. Got excited. I’m happy to have found you. It is so freezing in London at the moment I am staring at your gif of the steaming hot pot pie and literally drooling. Looks amazing! 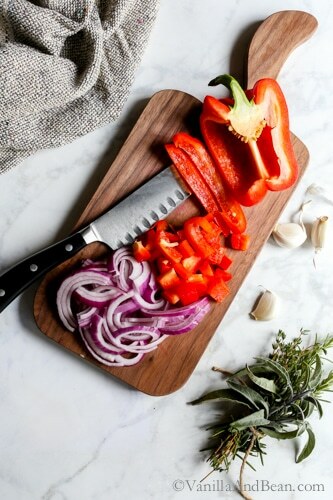 Glad to have discovered your blog – lots of inspirational recipes! Awh, thank you Lucy! Welcome! What is it with steaming hot food!? Especially this time of year… comfort food… just sayin’ ! This looks amazing. I new to cooking dried beans and black eyed peas. Are the peas prep cooked before you put them in? Or do they cook OK right in the pot? Hi Katie! When working with dried black eyed peas, in this recipe, just sort through them making sure there’s no small stones, and give them a rinse under running water. At this point you’re ready to use them in this recipe! The peas go in the pot dry and they’ll cook up with all the other ingredients. Thanks for asking Katie! Just in the process of making this but can’t seem to see what is done with mustard and Tabasco! Help! Wow Traci I love your Site. 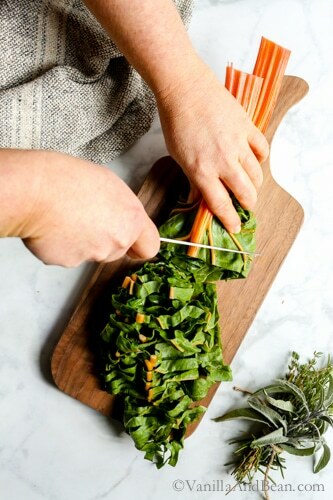 This recipe looks so delicious and so carefully documented.. and the GIF!!! Lovely. LOL :D You crack me up, Julie! Thanks so much CakeSpy! :D Nice to see you here! I have the same history with black eyed peas and my grandmom. She always serves hers with sweetened tomatoes and a large piece of cornbread. You really have my drooling here with this recipe. I also love how you managed to capture that smoke. I need your tips for that! Awh, that’s so sweet Amanda. Served with sweetened tomatoes sounds so delicious! I should work on a photography tips page :D . I hope you enjoy the recipe Amanda! LOL :D ‘kicking and throwing fit’ hehe. Thank you Medha! You need to teach me how to make GIFs! This dish is gorgeous and absolutely genius. Cornbread topping? Swoooooon! This is beyond stunning. That GIF. How did you do that?? (Oh, right, because you’re ridiculously talented.) In this neck of the woods, we need all the hearty comfort food we can get and I think this is a great opportunity for me to try black eyes peas. Awh, thank you Nora! Black eyed peas are a must!! Please try them! I don’t think you’ll be disappointed. Perhaps I should do some explaining on GIFs on a photography page? THAT GIF. My mom just got us a caste iron pot, and I’m so excited to use it! 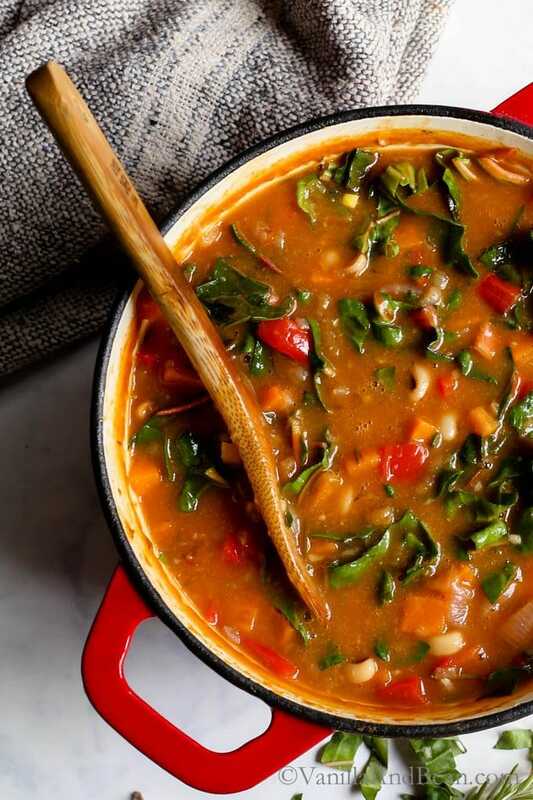 Black eyed peas don’t make their way into my diet as much as I’d like them to, so I’m bookmarking this soup for later! :D Oh those dutch ovens are so handy to have in the kitchen. I have one and it gets a workout! THIS.LOOKS.DIVINE!! I love that GIF too. Makes it even more tempting :) I will certainly be making this soon! Oh my gosh this sounds and looks delicious! 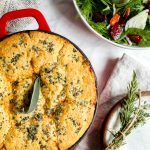 I love the idea of a corn bread topping oven an entire pot of delicious goodness! Wow, Traci, I am so impressed! Wonderful pictures and recipe! I’ve never cooked something like this before, but this cornbread and all the wonderful veggies in the filling make me just wanna try it right now….so good! Thank you, Evi! For freezing, after cooking just portion out what you need in individual sized serving containers (or if you’re cooking for more than one, freeze how ever many portions together) and pop in the freezer. Thaw in fridge overnight, then bake on 350F for about 15 minutes to rewarm and re-crust that topping! 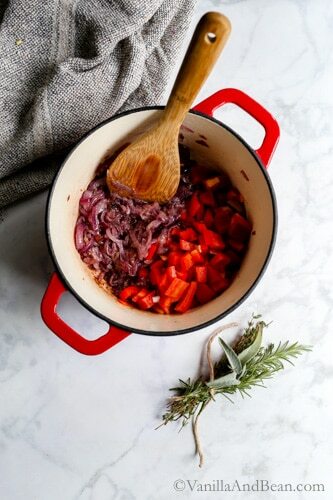 I’d love a big bowl of this right now – looks so comforting and hearty. And the best thing about pot pies – they are just packed with healthy veggies. Oh… and the cornbread topping doesn’t hurt either. 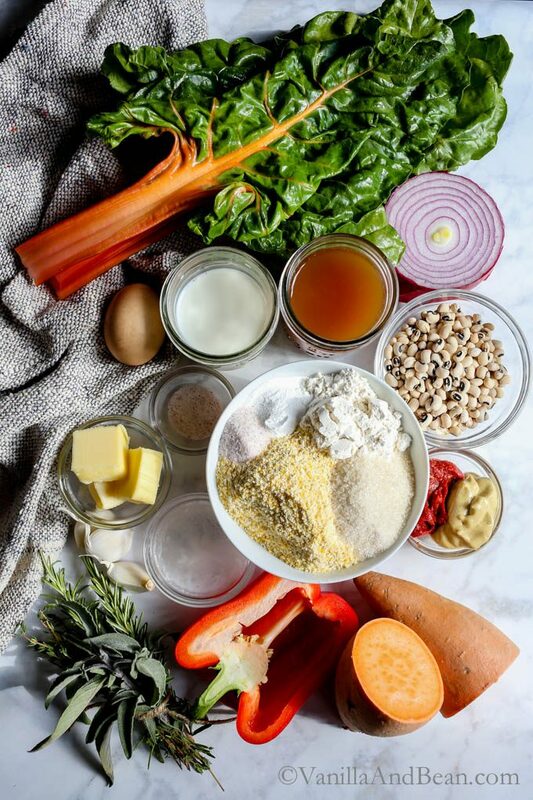 Love the prep shot showing all the ingredients. Can’t wait to try this, Traci! Sounds delicious but as I’m not much of a sweet potato fan. I was thinking of substituting for a mix of regular potato, carrot and pumpkin – keeping it sweetish but not too much…. what do you think? Thank you for the tip. Will let you know how it goes. Traci.. I’m over here giving you a slow clap. A slow clap! Why? That steam shot.. that is amazing!! Truly incredible. I LOVE a pot pie but hubby gets tired of the same ol’ thing.. so we have to try this! This looks delicious! I definitely could use some comfort food right now. Its snowing a little bit outside my window! My goodness Ceara, thank you for all your shares! :D I hope you enjoy the pot pie! Comforting? Oh yeah!